Ruckman Rhys Stanley will undergo scans to learn the full extent of the damage to the left calf he re-injured during Saturday's loss to Hawthorn at the MCG. A late withdrawal last week against Richmond, Stanley suffered a recurrence early in the second term. Coach Chris Scott said his medical staff would look for answers early in the coming days ahead of next week's clash with Fremantle. "It's always hard for the medical staff to tell straight after the game, or during the game," Scott said. "It was pretty clear that he couldn't keep going so that's not a good sign. "It's a re-injury so that tends to make it a little more complicated." A dejected Stanley watched on from the back row of the bench as defender Mark Blicavs was thrown into the ruck with assistance from 191cm rookie Jack Henry. 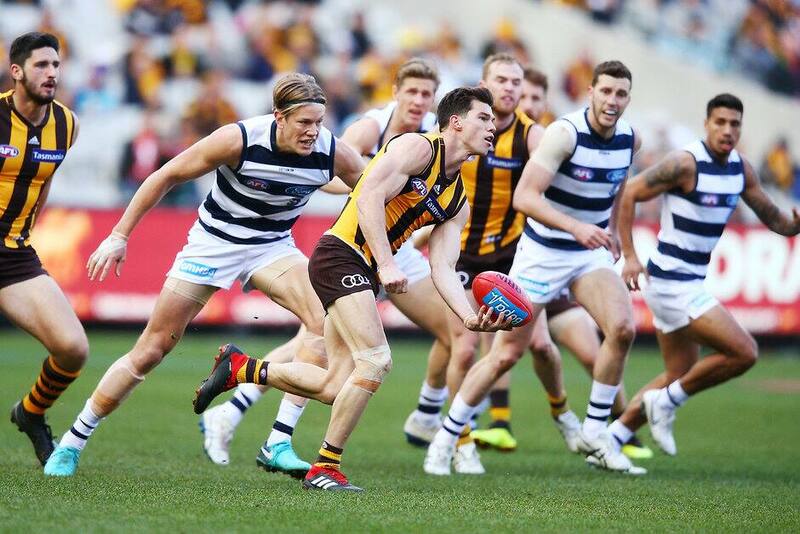 It allowed Hawthorn's Jon Ceglar and Marc Pittonet – a late inclusion for injured captain Jarryd Roughead – the gain ascendancy around stoppages. Meanwhile, Scott was confident defender Zach Tuohy had escaped serious damage from the right hand injury he had assessed during quarter-time. Tuohy appeared to hurt his right pinky finger while spoiling a ball in the first term, before returning to the field with it heavily strapped. "I think it's a really good sign he could keep playing so I think that suggests it's not too serious," Scott said. Veteran swingman Harry Taylor will make his return during Saturday night's VFL match against Essendon, with Scott conceding he was a "40-60" chance to play next week. Fringe ruckmen Zac Smith and Ryan Abbott – who debuted in place of Stanley last week – are set to line up alongside Taylor at GMHBA Stadium.